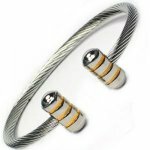 Stainless Steel Bio Magnetic Therapy Bangles and stainless steel magnetic Bracelets offers many designs and plating (gold, silver). 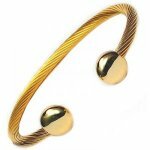 The stainless steel magnetic bangle or bracelet contain strong magnets pointed towards the wrist. 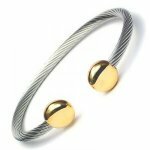 The size of the bracelet can vary from thick, broad Stainless Steel Bangles or Bracelets that appear strong and chunky to thin, slim ones that appear delicate. Your personal sense of aesthetics will determine which of the styles available will suit you the best.